He played a very good defence. He's 21 and Baker's nearing 50. Green is a difficult colour to see on a green field. Goff didn't look very good in his rookie season. I nominate @Don Roshifor Browns forum Hall of Fame. 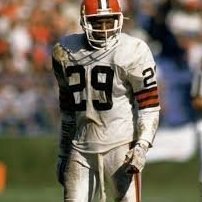 Baker has Hue/Haley as a rookie and looks good. I don't think a QB should be judged based on a not so great rookie season. Darnold's still younger than many college QBs. Having said that, I'm glad we have Baker. @Mind Character, I don't think it's really a big thing with either QB, but maybe include rushing yards each game for each? It is meaningful, especially in games where there are big impact runs like with Baker's last week. Will be interesting to see how their rushing yards and TD totals compare at the end of the season. There can be exceptions but it's definitely a bad sign to look awful. Goff only had about the same amount of attempts as Baker has as a rookie so it really wasn't enough of a sample size. Goff had 5 TD and 7 INT and Baker has 6 TD and 5 INT. So while Mayfield has looked much more ready than Goff did I don't think Goff looked awful, just not ready and overwhelmed. He wasn't Kizer bad. Weird stat. Speed of the game is a rough adjustment. Baker will grow. Yeah there’s a lot of sacks that are on Baker, which is understandable with a rookie. What does this mean though? So Baker had at least 2.5 seconds to throw 62% of the time? I think he will always take some sacks, he likes picking up chunk yardage. Baker has also escaped a lot of sacks, probably more than 90% of the league. At Baker's worst he looks like an NFL QB so at least we are set there for awhile.